Despicable Me – 4K Ultra HD Blu-ray review | What Hi-Fi? A criminal mastermind adopts three orphans to help in his nefarious scheme, but finds it's not easy being a villain - or a father. A second-generation immigrant of a single-parent family, struggling against an unloving mother to prove his undeniable genius. His battles with like-minded competitors are merely a way of coping with his own inadequacies - yet it is only when he brings three girls out of the horrors of an uncaring adoption service that he changes his destructive (and self-destructive) ways. You wouldn’t expect something so sophisticated from a film with Steve Carell doing a silly combination of a Mexican/Hungarian-American accent throughout, would you? You perhaps also wouldn't expect this to be one of the very first 4K Blu-ray discs to feature Dolby Vision and HDR10. A surprising release in more ways than one, then. MORE: Dolby Vision vs HDR10: which is better? Despicable Me is more than just the yellow Minions that you might have seen. Felonious Gru (Carell) is a super-villain fallen on hard times. With the The Bank of Evil - the main source of cash for villainy - focusing on a younger demographic, in this case, a super villain called Vector (Jason Segel), Gru realises he doesn’t have the funds to carry out any more nefarious schemes. To get the upper hand on Vector, Gru adopts three naive young girls, Margo, Edith, and Agnes (Miranda Cosgrove, Dana Gaier, and Elsie Fisher) with a plan to have them infiltrate Vector’s McMansion fortress and sabotage his plans. Of course, being a villain, he plans to abandon the orphans once he’s done with them. The relationship between Gru and Vector is like that of Wile E. Coyote and the Road Runner, Gru constantly failing to get the better of his foe. It pushes the plot along, and you get caught up in each character’s development, but the subplot is Gru’s growing emotional maturity, which is derived from his relationship with his adopted family. It’s your classic Grinch-like transition. Gru’s heart grows three sizes when he spends time with the children and, in a climactic final act, he saves them from his nemesis. Despicable Me is the definition of ‘family friendly’ viewing. Your kids will enjoy the rambunctious, sassy antics of Margo, Edith, and Agnes and the child-like Minions, while parents might empathise with the frustrations Gru - as a new father - has to deal with when it comes to taking care of them, and the lengths he eventually goes to in order to protect them. Add in the spectacle of heat-seeking missiles, spaceships and squid-guns, and you have a film that confidently balances humour with having a heart. Despicable Me is an animation, so it's difficult to guarantee sufficient variation in its scenes to really show off your home cinema system. With live action, there will at least be a beard, a hairline, skin pores or other human elements to focus on for detail. Similarly, there’s no telling whether a rendered sunrise will have the same effect as a real one. So, it’s a testament to the quality of this film that Dreamworks has clearly invested a lot of time and effort into achieving an insightful picture, even in throwaway scenes. And it looks superb in Ultra HD. When Gru disguises himself as a Rastafarian to break through Vector’s defences, the dense mesh of hair in his faux dreadlocks is impressively detailed, as is the texture to his multicoloured hat that is closer to the real thing than many other CGI films. As you'd expect from a film aimed at kids, it's brightly coloured and punchy, but that’s not to say there's no nuance. For the scenes in the adoption agency, you’ll need something capable of handling the subtle hues to the light streaking through the windows or the sparkle in the childrens' hopeful eyes. There are even solid tests of dark detail too; a large obsidian rhinoceros chair should contrast with the lighter greys of Gru’s 'dog', and during the climactic scene when Gru pilots a rocket into space the blacks, blues, and purples packed into the background should remain distinct. As mentioned, Despicable Me (and its sequel, Despicable Me 2) are two of only three Ultra HD discs that have Dolby Vision support (Power Rangers is the other). An alternative to HDR10, Dolby Vision uses dynamic metadata to adjust the image frame-by-frame, in theory providing the picture precisely as the director intended. However in our initial test, we found that the Dolby Vision version of Despicable Me didn't look as good as the HDR10 version, the film’s punchy colours coming across a little pale and flat. That’s not to say we'd write Dolby Vision off - far from it - but it’s possible, based on this sample size of one, that a quest for improved subtlety will be better suited to live-action films. The Blu-ray version, which comes with the Ultra HD version, has the same caveats we’d usually add when comparing Ultra HD and Full HD. There’s a distinct drop in detail to Gru’s pink spacesuit (despite the impressive upscaling efforts of our Oppo UDP-203 Blu-ray player) and the lack of HDR does mean the contrast is a little less sophisticated - but rest assured, those with a Full HD TV will still find it an enjoyable watch. The audio coding on the Ultra HD Blu-ray comes in the DTS:X Master Audio format (and DTS:X Headphone if you’re using headphones), while on the Blu-ray it's standard DTS-HD Master Audio. This is codec that aims to create multi-dimensional sound, similar to Dolby Atmos; but unlike Atmos, which requires you to add extra overhead channels, DTS: X works with standard surround speaker setups. Once you have your Blu-ray player and amplifier set up correctly – you might need to change the decoding to ‘Straight’ mode (or a similarly-named setting) to ensure there is no additional processing on your audio - the effects are immediately obvious. There is a heightened vertical aspect to the sound, such as when a drill burrows its way through the roof of a top-secret facility. When the camera is on the workers, the sound appears to be coming from the far left, upper corner of the room, but when the camera changes, it switches to the left and centre channels. And there’s much for your sound system to contend with. The deep thuds of a stomping elephant have a different texture to the earthy rumble of rocket engines, allowing your bass drivers and subwoofers to reveal the distinction. There are layers of clicks and whirrs to the computer systems or the super villains' high-tech weapons. Even sounds out of shot, such as the rustle of fabric as Gru walks in his spacesuit or an ice cream melting in the sun, are given attention. Missiles fly from left to right, and the sound of rubble cracking will be a good test for how your sound system can handle precision and organisation. 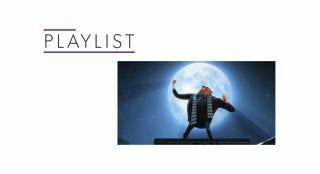 There aren’t quite as many rapid transitions between quiet sounds and big bombastic set-pieces as we'd like, so as a test of quick-change dynamism, Despicable Me isn’t the best. To its credit, there is a lot of sonic build-up to large explosions, but we’d like a couple of good, snappy scenes too. The takeaway message from Despicable Me is knowing what’s really important in life, caring for those in an oppressive, domineering system, and never underestimating someone with a piranha gun. It’s a dazzling, bright, fun film that is sure to entertain the young ’uns - and playig with the HDR picture formats can keep the adults enthralled. Heartily recommended.